Many of you may be wondering about our latest display window, which is chock full of guitars, gold records and vintage rock memorabilia. No, it’s not for sale…thank you to those who have already asked…LOL. This is actually a pop-up exhibit for The Delaware Rock and Roll Hall of Fame. Didn’t know Delaware had a Rock and Roll Hall of Fame? Now you do! 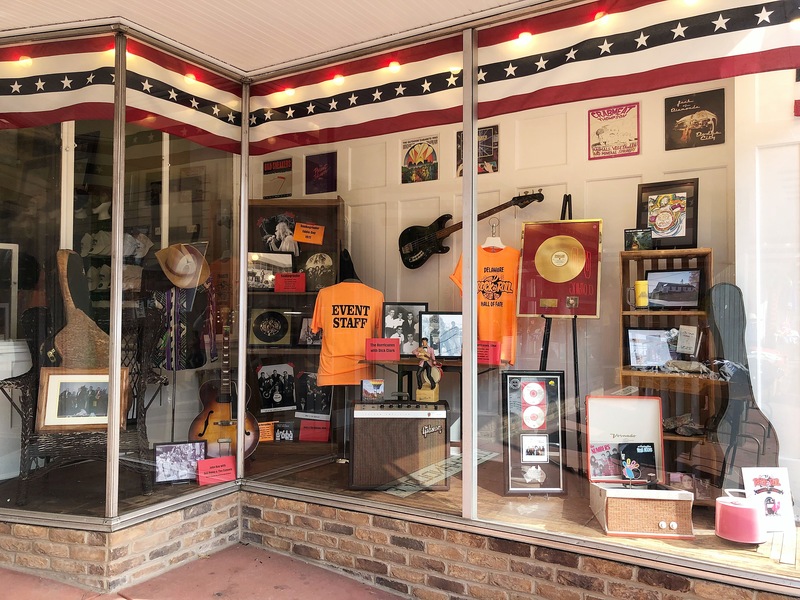 The Delaware Rock and Roll Hall of Fame is actually the passion project of two Newark residents, George and Paula Wolkind, who seek to celebrate and preserve Delaware’s musical history, as well as, educate and inspire future generations of Delaware musicians. Read more about their story in the Newark Post Online. George and Paula started off a few years ago with just a Facebook Fan page, but have since created a board of directors, launched an official website and are currently planning the inaugural induction ceremony to be held at Wilmington’s Baby Grand later this year. Their future plans include finding a physical location for the Hall of Fame to call home. If you are interested in learning more about the Delaware Rock and Roll Hall of Fame, be sure to visit the Delaware Rock and Roll Hall of Fame website, which features a virtual jukebox of local music. We also suggest liking their Facebook Page to stay on top of events. Thanks for stopping by! We hope you enjoy the display. Please feel free to leave your comments, musical memories or questions in the comment section below…we’ll do our best to get questions answered and pass along feedback.